Kabbalah Judaica Gold earrings with 4 of the 72 names. The circle is 3/4 inch wide. Total length is about 1 1/4 inch. The earrings are made of 14 Karat Gold plated brass and pearls. The earrings have a few of the 72 names inscribed in Biblical Hebrew letters. The 72 names of god are channels of energy that contain certain properties. If you like this piece, please don't wait! My collection is big but I only carry one or two items per design in stock. Production for 2014 is done, so once it's out, it will be out until sometime in 2015. Get yours NOW. The jewelry pieces are PLATED so they should not come in contact with water, or chemicals such as perfumes that will harm the plating. Improper care (such as showering, swimming, spraying perfumes directly on it or sleeping with it) of the piece can seriously harm it. If you like this piece, please don't wait! My collection is big but I only carry one or two items per design in stock. Production for 2014 is done, so once it's out, it will be out until some time in 2015. 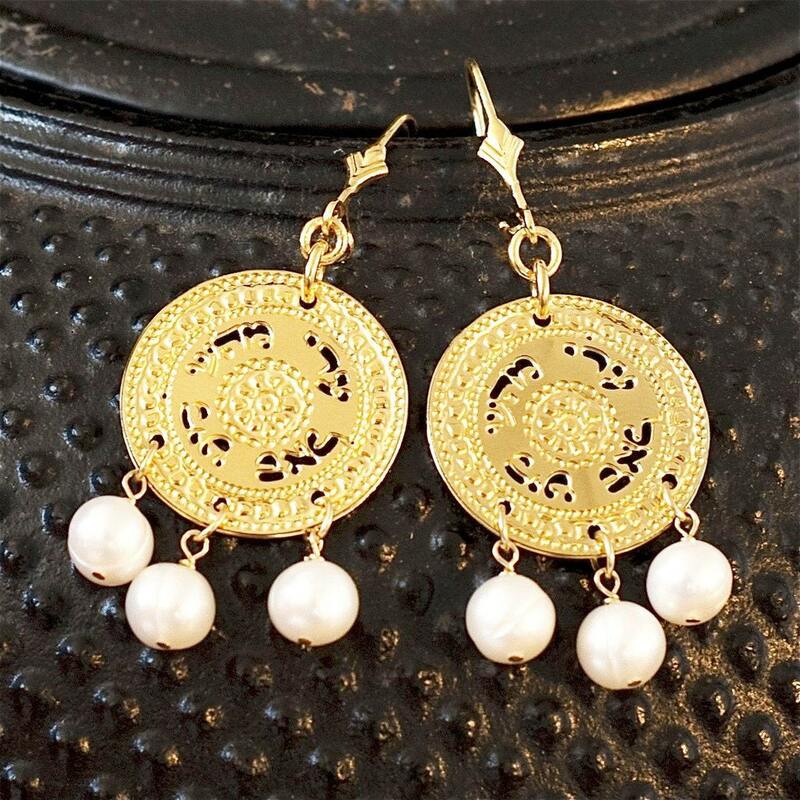 Thank you for looking at my gold pearl earrings I also make other judaica jewelry in my shop, and I'd love for you to stop by and check out the other earrings and the rest of the jewelry sometime. Payment is due at the time of order. I accept payment in the form of PayPal and Direct checkout. I will not mail any merchandise until payment has been completed. If you receive something and are less than satisfied, please let me know and I will do what I can to make it right. Please do not leave negative or neutral feedback without contacting me, if I do not hear from you, I have no way of knowing that you are unhappy with your purchase. I strive VERY hard to keep my positive feedback and keep my customers happy. *All return requests must be notified and shipped back within 30 days of arrival. Once I receive your notification I will send you return instructions. Please don't send anything back without following the instructions, it may result in unnecessary fees. *I do not accept returns or exchanges on special or custom jewelry orders, or after 30 days. *All returned items must be sent in its original container/bag. Once I receive the item back, I will issue a full refund or exchange within 5 days of arrival back, minus any shipping or customs fees. * Customer is responsible for all shipping costs, including return shipping. * Absolutely no returns on sale items or custom made orders. The shipping rate listed is for first class mail which takes 3-4 weeks to arrive. Please allow a few extra days for the order to go out. I make each piece to order. Please let me know if you would like faster shipping with EMS. I will adjust your invoice accordingly. On international orders, please remember that it is your responsibility to clear all customs, VAT taxes etc. I will not be held responsible for any of those. Since my pieces are handmade, by me, please allow 3-5 days PRIOR to shipping. However, if you absolutely need a piece much sooner, please let me know and I will rush the order. Since the items are shipped from Israel, tracking information for standard shipping might or might not be available for your country. If available, tracking info will be e-mailed. Wholesale & Consignment - Wholesale inquiries are most welcome. I do not offer consignment. Please send me some information about your store (name, address, website if you have it) and I will send you my wholesale information. Personalization of letters is NOT possible. Customization of any kind is NOT possible either. Absolutely no returns on custom orders. Packaging - Every piece of jewelry arrives in a cotton filled jewelry box. CARE INSTRUCTIONS - The jewelry pieces should not come in contact with water, or chemicals such as perfumes that will harm the plating. Improper care (such as showering, swimming, spraying perfumes directly on it or sleeping with it) of the piece can seriously harm it.